I've been watching this forum of a while but I figured it was time to make an account. I live in Mid Michigan and I just got a 89 Turbo Manual last November. I think I has about 157k. Ran amazing when I parked it. I've started disassembling it for a metal head gasket and I've discovered whoever worked on it before was a dunce. So, long story short and introductions out the way, I'm trying to decide between having my CT-26 rebuilt (57 or 60 trim) or going to a small/ medium t4. The price difference and time investment is my hang up right now. My short term goal is about 350-400 hp. I'm already set on 255fp, 550cc's, lex afm for now. And then I'll save up for a standalone since my long term goal is 600hp. No point in buying a piggyback then going standalone... Right? So Rebuilt ct-26 or small (68exh/70comp) t4? Any info and all opinions are welcome! Thanks in advance. Id go with a sound performance bolt on (around $1200+ USD) if you've got an aftermarket exhaust and are running an upgraded intercooler and piping already. Or if you're still running stock and are planning on changing it out the cheapest reliable option is probably an HX35 (which i can buy brand new up here for $900 CAD from a holset vendor) or a HY35 from a dodge cummins. Or you can find a used one and get it rebuilt. You will have to weld the internal wastegate and get and external one to avoid boost creep since the stock one doesn't flow enough. The CT-26 57 trim is usually going to get you just under 400whp with appropriate mods, and i dont think most would recommend the 60-1 which i believe is good for the low 400whp. A standalone is always going to get better results but if you're strapped for cash, and cant pay for tuning/dyno time. Piggybacks are fine if you arnt competent with tuning. SAFCs( are really simple to use as long as you understand the concept and can do basic wiring. The ECUMASTER DET3 is kind of a mix of both and a cheap option ($300 CAD) if you want to go that route as well. Thanks Grizzah. You mentioned that one thing I haven't figured out since stalking the forum... What's a "SAFC"?! I did consider the DET3... But I figure doing some basic mechanical tuning and waiting a couple months for a standalone would be a better option for me. You will need a piggyback after upgrading your turbo or you'll hit fuel cut when boosting. An SAFC is an Apexi piggyback, the newest one is called a NEO. If you arnt good with a computer I wouldn't suggest using a DET3 since it will be laptop tuning and a little confusing. I thought the point of the 225fp, 550cc injectors and LS400 maf housing was it was an easy way to trick the factory ecu to allow a little more boost? The 550 injectors compensate for the bigger ls400 maf (30% more air and fuel). 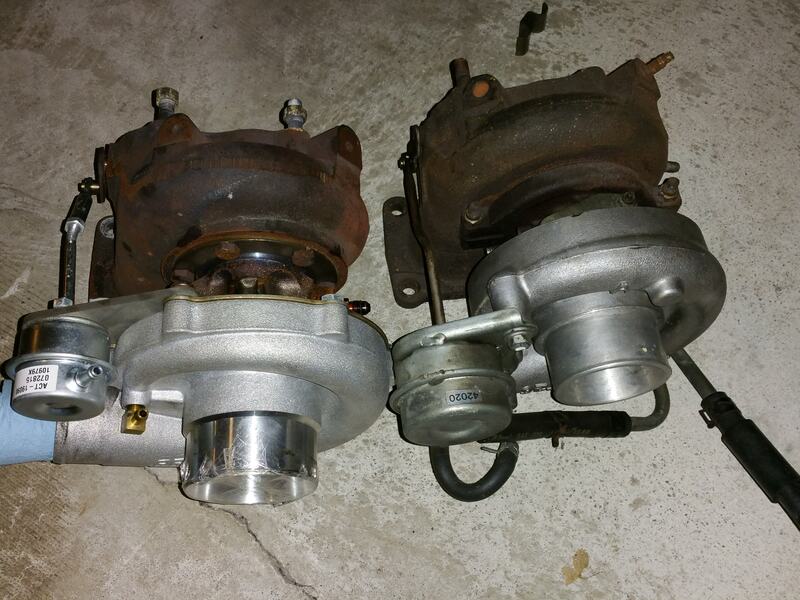 If you increase boost enough or change to a bigger turbo you'll need a fuel controller. You'll see this on your wideband when you get there. You wouldn't happen to know a rough limit for boost of the MAF housing and 550's would you? 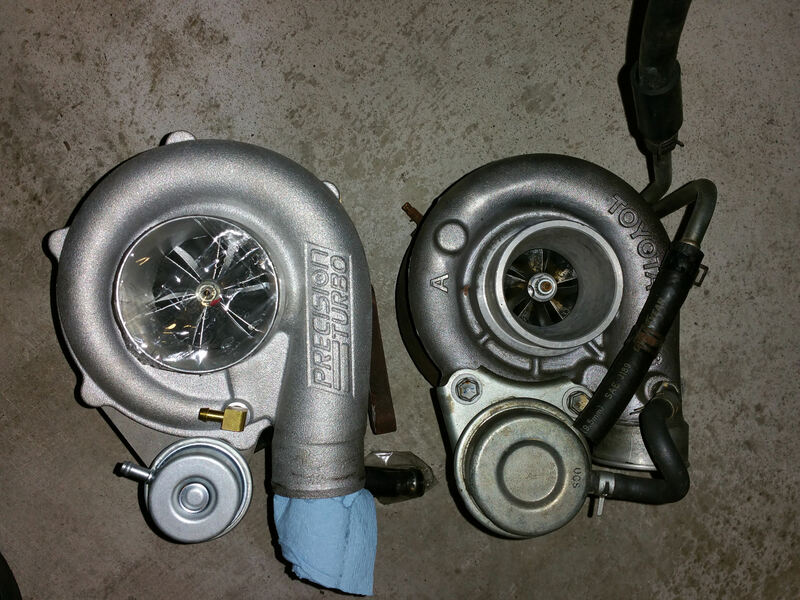 I am running the Sound Performance 6262 bolt-on turbo that Grizzah mentioned and the boost comes in very nice on that one. Piggybacks are nice but once you get up to certain power levels they just get in the way as you are trying to fight the limited factory computer vs a standalone in which you can run on almost any motor plus you have so many configurations, additional inputs, outputs and other options it is just endless... You also need to keep in mind you power goal you want and all the other parts such as fuel, motor internals and so on you will need to make that power goal of yours happen so I would recommend you make a list of parts. I am running the ECUMasters Classic and it is a very nice standalone but the beginning was a bit tricky to set up with wiring on a few items and the software. I run sequential injection set-up with waste spark ignition and the standalone fires the coils so no igniter or other items needed on my 7mGTE. It also makes 540whp on e85 and 450whp on pump gas which is right where I want it (for now at least lol). Check out my build thread in my sig and you might see something you might want to use. Howdy Plaaya69, quick question, are those Comp Cams valve springs a direct replacement for the stock springs? Hey Hybrid, yes those COMP 975 springs are a direct drop in replacement. The factory bottom spring retainer needs to be fully seated flat on the valve spring and it is a tighter fit on that piece than the oem spring but nothing crazy. They also come in 12 packs which is nice for us Toyota guys. Aluminum rad with dual electic fans. Maybe: 140amp alternator/ agm battery. Car already has a custom 3" exhaust from the turbo elbow back. If I stick with the CT-26, I'll be getting a stainless 3" elbow to make welding in the bung for a wideband easier and exhaust flow a little better. I'm either going to piece together my own T4 turbo kit including stainless manifold, 40mm wategate, hks bov, stainless oil line kit, I'll get a turbo with coolant fittings, driftmotion 3" v band downpipe and 4"intake, various couplers and hoses to make it all work. (I don't like buying other people's pre-made kits, just my personal choice, flame me if u wish), or have my CT-26 rebuilt by Albert or Driftmotion. I'm looking for your opinion on these 2 options. With all due respect, I'm not asking or expecting anyone to build my car for me. I believe going t4 would be more worth it in the long run, but I worry about all the little odds and ends I'd need to do also. Upgrading the CT-26 seems like a more cost effective/ easier upgrade for a substantial power increase, with supporting fuel mods. Sound Performance just posted a car on Facebook with a Precision SP 6262 bolt on that did 507rwhp. 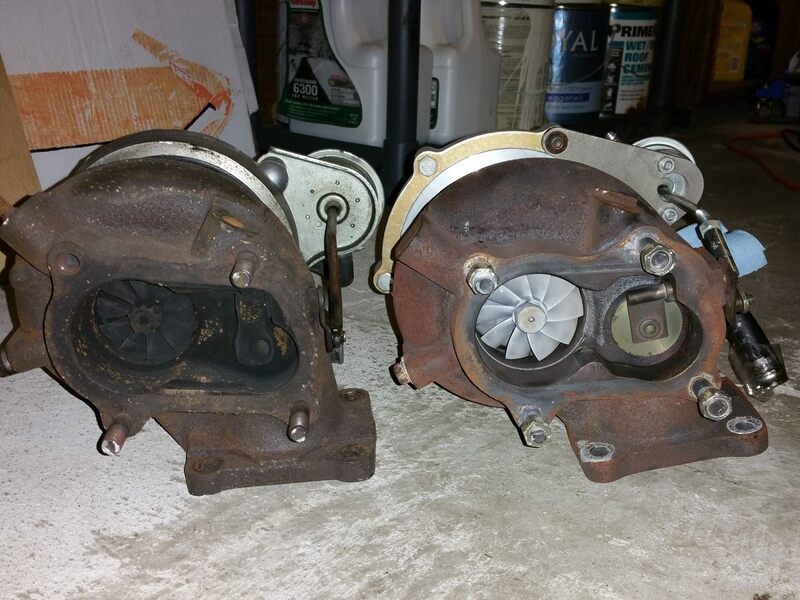 So step up to a slightly bigger turbo, and you could make the power you want. With those things changed out he said 600whp on e85 is possible on that sp 6262 turbo. If you go with a t4 turbo set up you will definitively have some good options but I have heard of some others complain about the quality of DriftMotion t4 turbos which is what I originally wanted to get but I am more than happy with the sp6262 turbo and glad I went this route because at the end of the day my power goal was between 500 to 600whp. Maybe I wasn't quite specific enough, although I do appreciate the responses I got thus far. I'm trying to decide between and UPGRADED CT-26 (57 or 60 trim) or a customer t4 set up for now. Phase 1 I'm calling OEM+ power build. This is where I'm at right now. I just want to slightly modernize and bump up the power of my 7mgte. Maybe throw in a better clutch if I need to. Goal is as close to 400hp as I can get with reasonable upgrades. Bang for buck. Phase 2 is where I'll be focusing on suspension and braking upgrades. Wheels and tires. Interior stuff (my seats are faded and stuff). Maybe some very subtle body mods and upgraded lighting. Towards the end of this phase I'll get a standalone and tune. Phase 3 will be my big power phase. When/if I get bored with my OEM + set up I'll get forged internals, bigger turbo, r154 rebuild, bc cams (probably stage 2, all the arp hardware, bigger fuel pump(s) and whatever else I'll need to support my ultimate goal of 600rwhp and 600rrtq on a moderately big turbo and e85. So, just FOR NOW, would anyone be able to give me a specific reason to or NOT to have my ct-26 upgraded to get near as possible 400 rrhp/tq? Because at this point I see that as my best option. T4 wouldn't be in your budget it sounds like, so call up driftmotion and ask about the right CT26 for your application. My clutch started slipping on a stock CT26 at 14psi so id keep that in mind for the budget. You wont be getting close to 400whp or crank without increasing the boost and you wont be able to do that without at the very least running a piggyback/standalone. You're going to be wasting money in the long term for your short term goal but that's perfectly fine, its all about enjoying the vehicle. The 60-1 trim seems to have some reliability issues long term from what I have heard others say but you have different trim options for the ct-26. Usually when people even consider a t4 turbo set up is because you want some bigger decent usable power. You even included it to vote on and we are just giving you advice. If you had your mind set on a upgraded ct-26 then I would ignore the votes and not even discuss anything else but by the time you spend the money on that you could have had something better for a little more for your long term power goal and still be usable for your short term goal also instead of pushing the upgraded ct-26 to the limits. Just my 2 cents. So it'd be more in my best interest to go t4 now, and upgrade to a bigger turbo later on the t4 set up? I guess that does make more sense... I just don't want to get a big lazy turbo right now since my car will be primarily for street use. I don't mind spending a lil extra ($300 or so) over an upgraded Ct-26 for a T4 set up. I think I've reaearched turbos enough to be able to pick a decent knock off for now, and when I go after big power with a built engine I'll get a nice name brand one. I'm guessing you guys are trying to tell me that's a more logical/ effective route? You wont be getting close to 400whp or crank without increasing the boost and you wont be able to do that without at the very least running a piggyback/standalone. You've said this at least 3 times now. I'm not doubting u, but is this absolutely necessary to extract 400hp? Even with a t4? I understand what fuel cut is. I understand AFRs. I understand how the Lexus afm and 550's trick the factory ecu. Are u telling me that 'trick' isn't going to be good enough to get me close? I definitely DON'T want to waste time on a piggyback. I'd rather save up a lil loner to just order the Ecumaster PnP kit from Driftmotion. Why wire in a piggyback when there's a plug and play solution? I can work the software just fine. I'll still have someone else fine tune it of course. SP 6262 bolt on gets my vote here. It's good well past your goal and should be plenty usable at ~400whp. If you want to spend money twice and get better low end, then get a 57 trim CT rebuild and aim for upper 300's. A standalone will be needed much past mid 300's so I'd just build that into your budget now, even for the first lower power stage. That's the website, but it looks like the site is having some trouble. It's normally good, but I noticed it was weird a couple weeks back. If you search "Sound performance bolt on turbo 6262" you should find info via google. Their facebook page has some mk3 dyno's with the 6262. Ok so its not just me having issues with their site... good to know. I'll message them on Facebook to get a price for this unit and specs. If the price is similar to a rebuilt CT, this is definitely the best option. Id go with a sound performance upgrade myself as well. I have to second plaaya69 regarding piggybacks. To give you the short story, if you use one and you pull fuel to lean out the mixture you inadvertantly advance the timing, if you add fuel you retard timing. What this means is you run the risk of detonation because you have no control over timing. A standalone while a big investment is the way to go. I just purchased a Megasquirt MS3 plug n play ecu myself, ecumasters like plaaya69 has is also a good option. Grizzah- would you chime in some more on what can be done with the emu det3? What are its limitations?